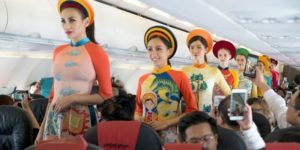 In a bold move that’s definitely going to be bringing in some strong opinions from people, one of Vietnam’s low-cost airlines, Vietjet Air – also called ‘bikini airlines’ has announced direct flights between Vietnam’s capital Ho Chi Minh City and New Delhi starting in July this year. 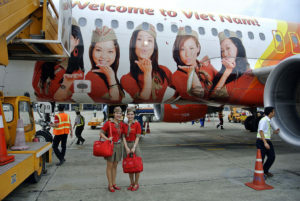 The Vietnamese low-cost airline had announced its plan to roll out the flight service in India at the Vietnam-India Business Forum on the occasion of the 45th anniversary of India-Vietnam diplomatic relationship. Due to its unusual uniform, this airline gained the popularity in no time. The carrier would reportedly commence its operations between July to August this year. According to the reports, the airline will run at least four flights in a week between New Delhi and the capital city of Vietnam. Launched in 2007 in Vietnam VeitJet aviation or we can say Veit Jet air got its name as “bikini airlines” after one of its promotional campaign that featured women dressed in bikini and swimsuits. The campaign worked overnight and the airline’s image was revamped from low-cost carrier to bikini airlines. This airline is founded by Nguyen Thi Phuong Thao, who later on becomes the country’s first lady billionaire. The airlines had been in the center place of controversies since its makeover. It grabbed occasional headlines when its stewardesses serve the passengers wearing the bikini as a uniform. It also came into the picture when it was severely criticized when bikini-clad air hostesses onboard the flight carrying the men’s soccer team who were returning from an Asian tournament from China. The airline takes its negative publicity positively and believes that everyone has the right to wear what they like. It does not consider its marketing as sexist. It is always not warmly welcomed and accepted due to its uniform in many countries. We wonder how people in India will welcome this strong decision. I am sure people can’t wait to board this flight asap. Wink Wink! Next articleHop Hop Hurray, Let’s Play At A Trampoline Parks !